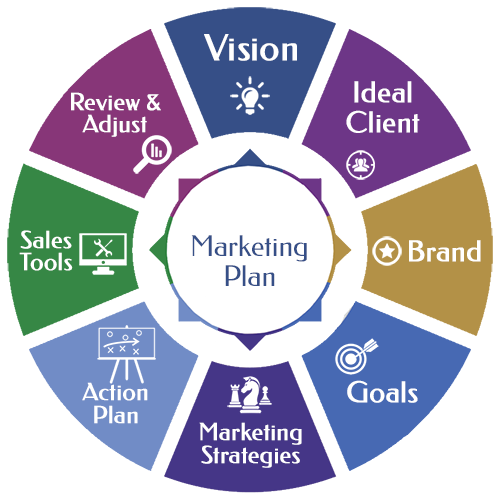 Marketing plan – those that plan win! Those that plan … win! A good marketing plan dovetails with your business plan. Together they act as a navigation system for your business: assessing the conditions and setting the strategic direction. Your situation analysis: Seek first to understand your theatre of activity – especially in relation to your customers and competitors. Your budget: What you can afford and who is going to be accountable for the expense and results. Describe your products or services and the benefits you provide and how they set you apart from your competition. Bear in mind that target audiences have become increasingly specialized and segmented – positioning your product or service competitively requires an understanding of your niche market. Summarise your company’s strengths and weaknesses. What do you offer that gives your business a competitive advantage? Describe any external opportunities /threats such as an expanding / contracting market for your product. You may want controlled growth within your ability to fund the expansion. These are two focused business goals that would directly translate into your marketing strategy. For example, for the first, you might want to design your marketing to deliver 5% growth per year. For the second you might decide that in 5 years’ time you wish to have only 50% of revenue derived from the current dominant segment. Having set your goals, you can now begin to define how you are going to achieve them. Continuing our example above, the diversification goal will demand active targeting of new segments. The tactics associated with that strategy are the marching orders to get there. For example, you might choose a geographic expansion strategy – perhaps via a network of distributors across the European markets. That might, in turn, require a change of packaging, translation of collateral, funding of co-marketing etc. A good marketing program targets prospects at all stages of your sales cycle. Some marketing tactics, such as many forms of advertising (incl. PPC), public relations, some social media and direct marketing, are great for reaching cold prospects. Warm prospects—those who’ve previously been exposed to your marketing messages —respond to permission-based email, nurture programs and taster events. Hot prospects – those ready to buy, generally respond best to interpersonal contact combined with re-marketing activity. To identify your ideal marketing mix, find out which channels your target audience turns to for information on the type of product or service you sell. Avoid broad-based media—even if it attracts your target audience—if the content isn’t relevant. The marketing tactics you choose must reach your prospects when they’ll be most receptive to your message. There are two approaches; allocating a percentage of income or the zero-based approach where the budget is built from scratch. The former can work in a steady state environment but has the obvious drawback that picking an arbitrary number (what was spent last year may be too much or too little!) The latter tailors spend to the plan and is especially appropriate when you are breaking new ground. So, ‘how much is enough?’. Many businesses find that somewhere in the range 4% and 8% of sales revenue is about the right investment. This is, however, hugely dependent upon industry, relative position in the market, marketing goals and the go to market strategy. If your marketing spend is less than 4-8% you either have a monopoly or you are potentially missing opportunities. If it is well outside the top of the band you may be spending too much. In either case you should review. Marketing is essential to the success of your business. It is often the first thing to be cut in a downturn, risking a deeper drop and a later / slower upturn. However, with so many variations of tactics available to reach every conceivable niche, there’s a mix to fit even the tightest budget with a little thought and creativity!